I first arrived in Montevideo on 1 December 2013 and Lotta joined me a few days later. Within another week we moved into a small serviced apartment in nearby Pocitos, a beach suburb of Montevideo. And for three southern summers that apartment was our home. It was not much of a challenge to feel at home in Pocitos. Within a short time, the doormen of the neighbouring buildings would greet us, together with the parking attendants and the armed guards outside the banks. On La Rambla, we quickly progressed from nodding acquaintance with the locals and their dogs, to greetings and conversation. After I had been to an excellent barber (Charles Oribe – Caballeros MVD) and Lotta had found a superb beauty parlour (Mariana Bello Peluqueria & Estética), we could not pass their premises without their waving to us. It was the same recognition and welcome that we received in the bars, restaurants and supermarkets that we frequented. And one of the parking attendants used to sing ‘You are my sunshine’, when Lotta passed him on her early morning run. We felt quite at home. When we returned for the second year, we wondered if we would be remembered. We need not have been concerned, for greetings transformed into hugs and embraces. We were now really part of the local scene and it felt so good. Outside a brand-new building in the next block to our apartment, there was a small chalk-board on the pavement advertising daily specials for a new restaurant, Fragolina. The restaurant was part of the large central lobby, with a small shopping complex, and had not been long opened. It was lunchtime, so we entered and ordered a meal and found the food to be excellent and plentiful. As soon as we finished eating, the chef came out of the kitchen, greeted us warmly and wanted to ensure that everything was to our satisfaction. That was our first introduction to Gaston Garrassini and his immaculate attention to detail. We returned to Fragolina at least a couple of times every week that we were in Pocitos. We never failed to feel honoured and warmly welcomed by Gaston and his staff. When we left in April 2016, there was Cecilia, Belén, Anna and Romina. And of course Gaston’s father, who used to sit at the bar or at an empty table, reading a newspaper, or working on his laptop, until there was a home delivery for him to take care of. Every morning Gaston goes to the market to select the best quality meat, fish, vegetables and fruits. And he never seems to follow a standard recipe, for each dish has a touch of his improvisation. One cannot please all the people all the time, but I suspect that there are very few who leave unimpressed with Fragolina and its staff. One of these days, perhaps soon, we will return. For three years, 2013-16, we escaped the cold, dark, barren northern winters and flew south, like migrating birds, to the welcoming warmth of the Southern American summers. Each year we rented the same apartment in Pocitos, a beach suburb of Montevideo. Our serviced eleventh floor apartment was just above the top of the trees that completely shaded the street below. It was a perfect location for us, just two short blocks and three minutes from the river. From Montevideo, the Río de la Plata does not look like a freshwater river, for it is so wide that one cannot see Argentina, about 100 kilometers away at the closest point. Massive container ships, tankers and cruise ships, on their way upriver to Buenos Aires and beyond, look like tiny toy boats on the distant horizon. When one of the regular earth-shaking tropical storms hits the upper reaches of the river, for days the water is brown with sediment. Along the river runs La Rambla, a wide promenade, that stretches along the coast for more than 30 km, and is reputedly the world’s longest uninterrupted sidewalk. Every day, almost without exception, we walked on La Rambla, first in one direction, then in the other. After a short time, we started to recognize the locals, and before long we were greeting each other like neighbours. Some times we would count how many people we had spoken to in the course of a walk, and the number would usually end up in double figures. We felt very much as part of the community, for Pocitos had the feel of a village. On La Rambla we also got to recognize the local birds, not just the species, but in some cases the individuals. There were numerous birds along the river, some quite exotic. There are reputedly more than 450 different bird species to be found in the relatively small country of Uruguay; the internet site, Avibase, lists 479. Not only is Uruguay on the major migration path for many birds, but the country has plentiful water and a climate without extremes. It was not long before I bought a book on Uruguayan birds and in the second year Lotta turned up with a new camera to photograph them. Most days when we passed the end of the beach at Pocitos, there were several small snowy egrets with yellow feet, fishing at the edge of the water. Often there was also a much larger great egret. 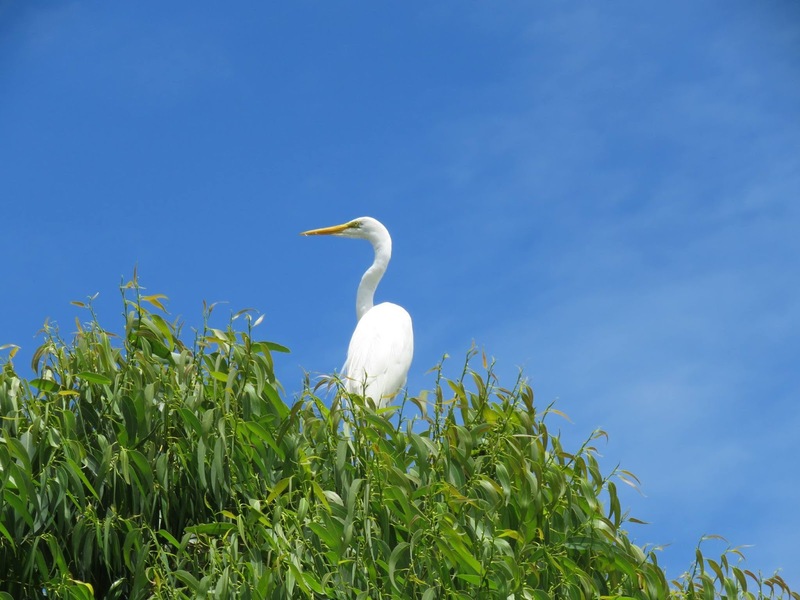 We once spotted a great egret sitting on top of a tree, near the small harbour at Punta Carretas. When we went around and through the trees to get closer, we saw a black-crowned night heron. It was a young one and it flapped away before Lotta could get a second shot. Although we went back on other days, we never saw it again. Where there were rocks by the river, inevitably there were cormorants with wings outstretched, drying their feathers. Once we were very fortunate to witness a large flock of cormorants in a long semi-circle, hunting together, driving a shoal towards the shore. We could see the fish splashing in the water, trying to escape their predators. Everywhere where there were mature palm trees, there seemed to be colonies of monk parakeets. When they are feeding on the grass, they are well disguised, but when they are flying or gathered on a palm tree, they make their presence well known, for they make quite a racket. Humming birds are tiny; they hover and then move so quickly that one has to be lucky to see one, and even more fortunate to take a photograph of it. One day we hit the jackpot, just up the hill from Playa Ramírez; a tree in full flower with many humming birds feeding on the nectar. And for several days they had a banquet on that tree. Above the hill behind Playa Buceo, we often saw this little hawk, resting on a light pole. If not an american kestrel, it was similar. Even in the strongest wind it was able to hover motionless for several minutes, sometimes not far from us, then it would suddenly drop, grab its prey and fly off to nearby trees. The southern lapwing is Uruguay’s national bird and in the summer they are plentiful, especially on the parkland between the golf course and the river, after heavy rain. The lapwings have a strange hesitant walk, that always reminds me of John Cleese in Monty Python’s Ministry of Silly Walks. During our first year in Pocitos, we used to see one lapwing that was always on its own. At first we thought that it was always standing on one leg, but when it started to hop, it was obvious that it had only one leg. It appeared to be quite healthy, but perhaps the rest of the flock rejected it for not being quite normal. I guess that handicapped people in our society can suffer the same rejection. The last year that I arrived back in Pocitos, I settled my few possessions in the apartment and then went out for a short walk along La Rambla. At the end of the beach, there is a small park and there on the edge of the park, waiting for me, was the southern lapwing with only one leg. I felt as if I had come home. 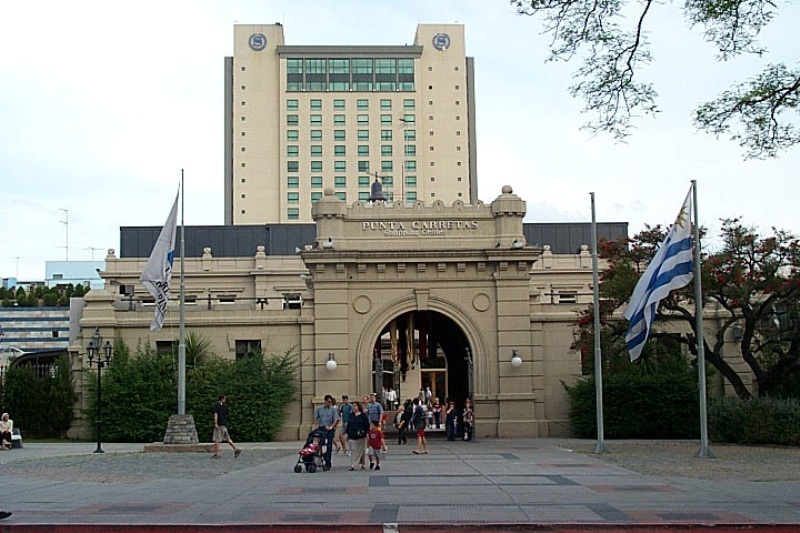 Situated on a hill overlooking the river, one block from the Montevideo golf course, and connected to the 26-storey Sheraton hotel, one can find Punta Carretas Shopping with its 180 shops, food hall and multi-cinema complex. It is the most up-market of Montevideo’s shopping centres. Once inside the austere external walls, there is little to differentiate this centre from any other American-style centre; the shops display most of the same global brands that one can find anywhere. But the language is a South American giveaway: almost exclusively Spanish with a smattering of Portuguese from Brazilian tourists, or occasionally English from Sheraton guests or cruise passengers in port for a few hours. But this building has not always been a shopping centre. It was originally the notorious Carretas prison, built in 1910, when the area was well outside of the nucleus of Montevideo. In the era of the military dictatorships of the 1970s and 1980s, many of the captured members of the Tupamaros, the urban-guerrilla movement, were imprisoned there. In that same era, an estimated 14% of the Uruguayan population were forced into exile abroad. In the years 1931, 1971 and 1972, there were three major escapes from the prison, using tunnels. In 1971, 106 prisoners escaped through a tunnel that ended in the living room of a neighbour’s house. 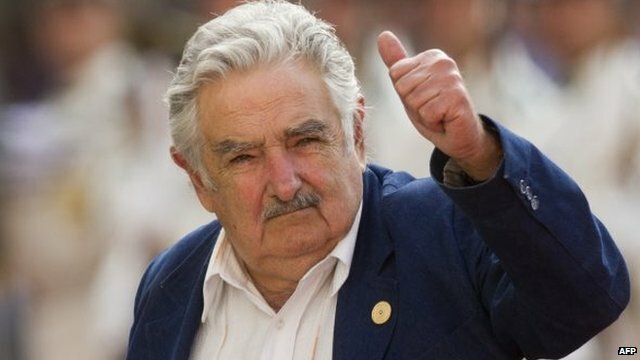 One of those prisoners was José Mujica, who eventually ended up as President of Uruguay in 2010-2015. 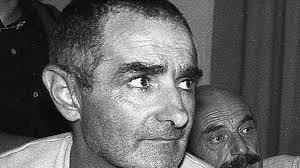 He was shot six times, captured four times and eventually released in 1985. With his austere lifestyle, refusing to live in the presidential palace, driving his own old battered Volkswagen and donation of 90% of his salary to charity, he became known as ‘the world’s humblest president’. In the photos one can see Mujica as he was the day he was released and today. Only the nose is recognizable. After the end of the period of dictatorship in 1985, the prison was closed. Following a competition, the building and site were eventually sold to a developer, and in 1994 the shopping centre was opened. With its luxurious multi-storey apartments, desirable single family homes and restaurants, today the Punta Carretas area is one of the most sought-after addresses of Montevideo. Apart from the external walls of the shopping centre, there is nothing to reveal the area’s undesirable past. Many of the ex-prisoners are still alive today and at least one of them escorts curious tourists around the building and explains how the prison used to be. For those ex-prisoners it must seem ironic that every day hordes of people, of their own will, enter the place from which they once struggled to escape. When I migrated from Ireland in 1965, to see the world and make my fortune, more than fifty years ago, my first port of call was Toronto. I made many good friends there and had a lot of fun times. But I could not stand the awful dark, cold, dreary winters, and after five years I moved to Australia, the climate of which suited me much better. Then followed a string of countries – eight in all, until I find myself today in Uruguay for the third year, soaking up the southern summer sun. Recently on one of our daily long walks along La Rambla, beside the river, I noticed that a small park area at Punta Carretas had been cleaned up and a number of comfortable benches installed. 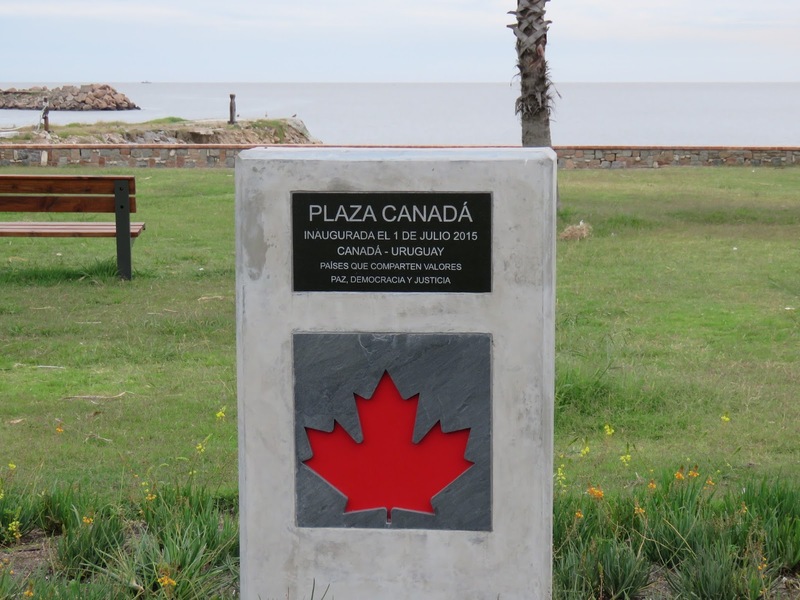 And today I realized that the park had been dedicated to Uruguayan Canadian friendship. And the park is home to a family of herons that keep watch over it.